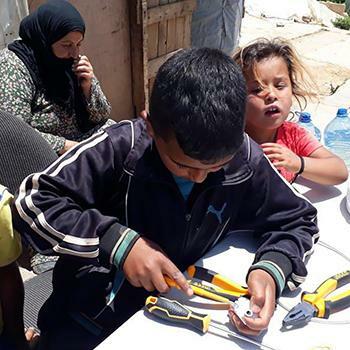 Our role as GHNI-Lebanon is creating and providing Transformational Community Development (TCD) education and Vocational Training Projects (VTP) for refugees in many creative and effective ways. Our trainees can then overcome their problems and sustain themselves in their present community and in their country when they return home. The Syrian war has persisted for eight years now, and many new refugees are still entering Lebanon. They are running for their lives from danger and death, seeking better living situations than in a torn-apart country. In this continuous crisis, most of the children are without education. The traditional blue-collar market is flooded, and the need for vocational training has been perceived as an effective and practical solution for sustainable living. The recent electrical training attracted many young people who were enthusiastic and motivated to learn something new. As the group gathered in the hot weather, they were eagerly listening and grasping the material being explained. The mother of Ibrahim--a woman from the camp--brought her broken fan from the tent and asked if we could fix it for her. The technical problem was presented for the trainees to solve. It was a lesson implemented on the spot and accomplished with success. A broken fan showed the trust and hope of refugees in this project and the success of fixing the broken item gave confidence and inspiration to the striving and thirsty trainees. More programs, as well as more material, are continuously needed to conduct the training. We remain thankful and grateful for the progress achieved so far, and we hope to reach even further potential with your support.